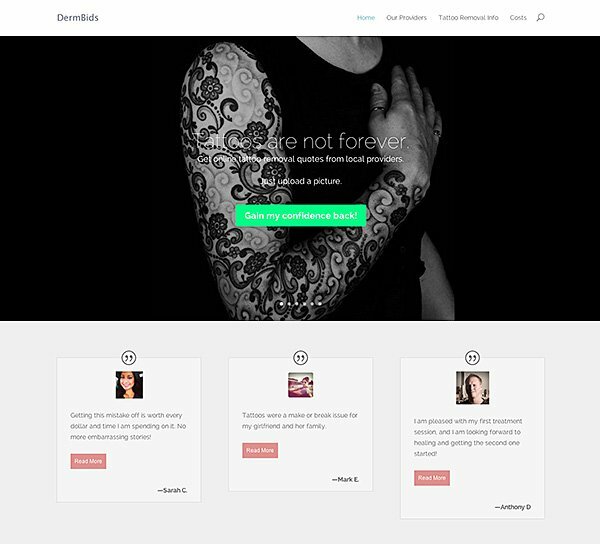 DermBids is a service that helps people compare tattoo removal quotes from local providers, just by uploading a picture of their tattoo. I believed there had to be a better way to shop around. So, I started asking my friends if they had tattoo regret. To my surprise at the time, most of the people I talked with did have tattoo regret! I thought there could potentially be a business idea here so I did a lot of research and asked more friends about their regret. I wanted to ask people questions to understand their tattoo regret, find out their interest in tattoo removal, and learn what might prevent them from following through with removal. I researched the right questions to ask to validate my assumptions. I hustled Twitter to find people that were complaining about their tattoos as well as random people on the street (literately) and asked them to fill out a survey I made. To my surprise they did! After I started to get a few survey completions from Twitter, I used a service and paid people for completing the survey to expedite the process. As it turns out, there is a need for a service like DermBids! The next step was for me to see if people would actually upload a picture of their tattoo to a website. I put a very simple landing page together with Unbounce that contained a form. I started directing people complaining on Twitter to the landing page and again to my surprise, people started uploading pictures! During this time I was selected to participate in the Startup Leadership Program (SLP) which is a highly selective, 80-hour, 6-month world-class training program and lifetime network for outstanding founders and innovators. SLP Fellows have founded 1,000 companies that have raised $400 million. This program helped me understand product development, business validation and customer development. If there is a chapter near you, consider joining. Cool, I was on to something. Now it was December 2012. Now it was time to actually build a website. One of my friends had recently sold his blog and it was built on WordPress with a theme framework (not Elegant Themes). He recommended I give it a try. I had not heard of WordPress nor this other theme framework. I had tinkered around with HTML many years ago. CSS was not around at the time. I was in for a rude awakening. I bit the bullet and bought a non-Elegant Themes framework. I installed WordPress, the theme framework and immediately became disgruntled. No joke, I asked this other theme framework for a refund within 24 hours. 23 of those hours were spent researching a new theme framework. I came across Elegant Themes and it was a perfect match! I decided to go with the Lucid theme and use their builder plugin to help assist me with the website. In preparation for building the website I wanted to re-learn HTML and learn CSS. I took a couple free online tutorials at Codecademy so I could be at least somewhat knowledgeable. I suggest everyone take this class so they can make adjustments to the design on their own. I launched the website with the Lucid theme in January of 2013. While building the website I received great support from Elegant Themes on modifying CSS/PHP to get the design I needed. Although the theme, builder, and my own CSS edits got me to about 70% of what I wanted the site to look like, the Elegant Theme support really was the unsung hero in helping me get the website/business launched. Throughout 2013 I continued to add pages and blog posts to the website. I learned and applied SEO, content writing, and conversion optimization rather quickly in the process. I wanted to take the DermBids website to the next level and make it a traffic and conversion machine. Using Google Analytics I observed majority of DermBids traffic and conversions were coming from mobile. Elegant Themes support helped make Lucid mobile capable, but didn’t provide the best user experience on mobile. I looked for a mentor in the Chicago area to guide me and suggest recommendations to the DermBids website. Andy at Orbit Media Studios writes a fantastic blog, so I reached out to him to schedule office hours. He was gracious to meet with me and provide mentorship. After the first meeting with Andy, he suggested I design the website around the emotions surrounding tattoo removal. I agreed with him and decided to undertake a website redesign from Lucid to Divi. Divi Redesign Completed in December of 2013 – Sweeeet! Divi was available for download in December and I was super excited. Christmas morning excited. I downloaded the theme the day it was released. I knew Divi was the theme that would make DermBids the conversion machine I wanted it to be. It gave me the tools to build the website with an emotional feel and it was mobile responsive. This was key being majority of the website traffic and conversion was from mobile. I spent 2-3 weeks redesigning the website. I overhauled everything. Implementing a site redesign and transitioning themes comes with many challenges. Thankfully, the Elegant Themes support staff made this transition as smooth as possible. Immediately after the launch I wanted to gauge success of Divi. Was moving from Lucid to Divi the right choice for me? How would Google respond to the site redesign? Would my conversion rate go up? Google almost immediately rewarded DermBids with higher SERP rankings. 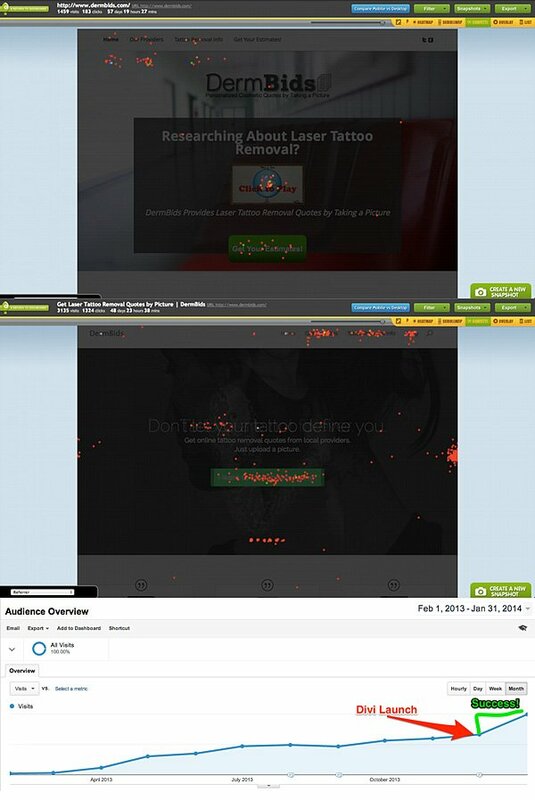 I use Crazy Egg to observe website traffic engagements. Take a look at the comparisons between Lucid and Divi. Average page views, clicks and time spent on each page are all up. Conversion rates increased by 35%, too. Making the choice to use Divi was by far one of the best business decisions I made. I’m looking forward to new features of Divi and working with their awesome support staff. Eric is the founder of Dermbids, a website dedicated to tattoo removal. He is an avid WordPress and Elegant Themes user, and he recently re-designed his entire website using Divi. Great post Eric. It’s awesome to read about the creation of Dermbids, and I think your use of Divi really shines. Thank you Nick for featuring DermBids on your site! What a great story. I use Divi as well and found it to be a great theme. I noticed your search button is a U and one of your buttons when you hover shows a 5 at the right end of he button. I ran into similar issues when I went to move my website from a subdomain I used for development and to my primary domain. I had challenges and the tech at HostGator knew the WordPress architecture cold and fixed it for me. If you find out what caused those 2 issues please let me know. You are creative and made really good use of a number of the Divi modules. Did you have a development area and them moved your site to a lives area? Nick, please ! I’m waiting for a résumé layout ! I remember that it was an option in a survey I answered about new possible layouts for Divi. I really love the MyRésumé theme, but a Divi layout for this would be great ! Well, I hope it could be possible. Thanks for all the work you and your team make to improve your product. What was used for your upload photo feature on the main page? I had the same curiosity. So I entered the page with Chrome, right-clicked on the “Get a Quote” button and went to “Inspect element”. It has the id “gform_submit_button_9”, so I googled “gform_submit_button”, and found the first result leading to gravityforms [dot] com. I guess that’s a pretty safe bet, but haven’t got the chance to inspect it further. Congratulations Eric; this is a great example of “form follows function”. Divi’s perfect for your cause. Nick, perhaps I’m in the minority here, but it would be great if you can showcase a blog / online magazine once in a while. I want to convert my blog to Divi sometime this year, but I’m still planning. Having a blogger / online magazine showcase will help build my confidence. Well written story! I was impressed by the focus on “emotion” and its design results… Makes me want to go out, get my first tat just so I can regret it and engage your site. As if life’s not rich enough with roller coaster rides. Awesome! We’re a few days out on a new Divi site. Conversion should go through the roof. Congrats Eric! I am testing Divi on a small fun site to get the feel for it. Has anyone used it for a bigger WooCommerce store? Great article, thanks for taking the time to share the journey! I put together my partner’s site using Divi and Woo with very few problems. Not sure it counts as a ‘big’ site but she’s very pleased with it! Congrats Eric and thanks for sharing your story and success. We’re revising our website from Trim to Divi and LOVE the design, options and, as always, the fantastic support community. Cheers! Just about forgot. Where in the world did you get the share buttons on the left hand side? Thanks again.. Thank you for your comment. Divi was great to DermBids and I know it will be great for your business, too! Interesting service as well by the way. Is this a growing market? Are tattoos losing popularity? Hi Sietse, thank you for your comment and your kind works about DermBids. The tattoo removal market is growing even though the acceptance of tattoos are growing as well. I wouldn’t say tattoo are losing popularity, more people are getting them resulting in more people having regret. Nice post and nice work on the site redesign. Looks great. I love Elegant Themes and use them on all of my websites. Nexus, and Divi have become my favorites though. These kinds of post are awesome, keep them coming and keep coming up with new awesome themes ET. I am loving Divi 2.0 and I hope to be able to share some of my future uses of it like you have shared yours. Great website and a great service you are providing. I too have fallen in love with divi and have made several sites with it. However, the only problem I haven’t been able to get it to work right on mobile devices, shows code and I’ve tried everything from the elegant themes plugin to jetpack plug in, and to de-activate all mobile plug-ins as I have read that it’s supposed to be responsive. Otherwise this theme ROCKS. Have left messages with support, but then just get people trying to sell me their services? OMG.. Really? Come on. Any answers? This is really helpful as we research solutions for our new website redesign. We are a small communication company in SC moving from being a company with no marketing to actively promoting our solutions. This also comes with a complete company makeover. So rolling out a responsive, highly attractive website is very important to me. I like what DIVI brings to the table. If there are some good designers/developers who have experience building sites with DIVI, I would be open to hearing from you. We do not have the internal expertise to take a theme and turn it into our website. Great looking site, I also designed my site with DIVI but I need some changes in to it. Like Post title appears before post image. How can I do that. I loved the look of Divi an started to build my website but I’ve given up. I’m an experienced WP user and manage several pages – so I have some knowledge. I wanted to use Divi because of the lack of the need to code etc because I don’t have time for that. If you watch the videos – more than once – and the readmes and it looks like it’s just a question of slotting in your info, and then off you go. However, as I dug into it I found that there were ‘quirks’ – which is fair enough as all WP themes do. The problem is that there seems to be a lot of background knowledge to these quirks and when you ask a question of Support you go round in circles until you finally get to an answer which approximates to your original one. That answer is written in a way that’s from someone ‘in the know’ and comes over as a tad superior. And some of the answers are written in a most unusual English too which makes them doubly difficult to understand. Interesting that elegant themes have not responded to your post. I too am after a drag and drop solution that allows me to build sites with a greater flexibility. The quirkiness you suggest and your experience with customer support leave me with big questions about whether this is the solution I am looking for. A problem I see is a horrible page speed for both mobile and desktop. May be you should considering optimizing it further? Thank you for the great and insightful information, particularly the codecademy for free coding lessons. I am in search of a website or resource that can really help with the building of wp sites using divi. Are there any really great websites with resources and or videos for the construction of sites for new folks? Sweet site man! I agree that Divi rocks – I used it to design my site too.